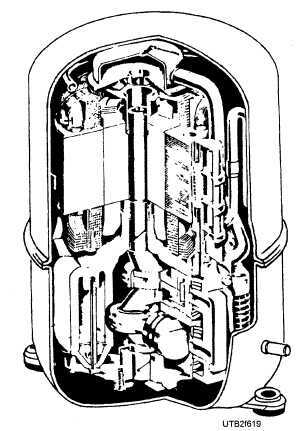 Figure 6-20.Air-cooled condenser mounted on a compressor unit. 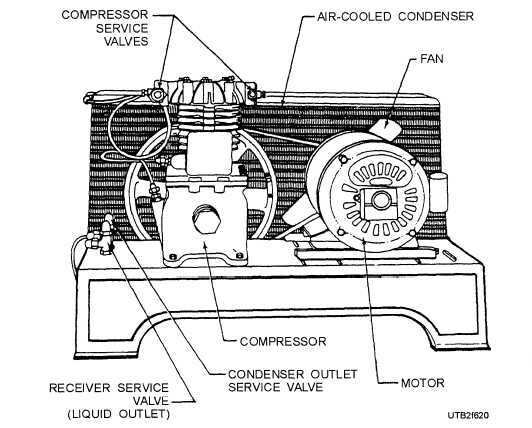 Home > Construction Training Manuals > Utilitiesman Basic Volume 02 > Figure 6-20.Air-Cooled Condenser Mounted On A Compressor Unit. Figure 6-19. - A cutaway view of a hermetic compressor and motor. condense the refrigerant vapor to a liquid. The liquid refrigerant then falls by gravity to a receiver (usually located below the condenser), where it is stored, and available for future use in the system. There are three basic types of condensers - air-cooled, water-cooled, and evaporative. The first two are the most common, but the evaporative types are used where low-quality water and its disposal make the use of circulating water-cooled types impractical. AIR-COOLED CONDENSERS. - The construction of air-cooled condensers makes use of several layers of small tubing formed into flat cells. The external surface of this tubing is provided with fins to ease the transfer of heat from the condensing refrigerant inside the tubes to the air circulated through the condenser core around the external surface of the tubes (fig. 6-20). Condensation takes place as the refrigerant flows through the tubing, and the liquid refrigerant is discharged from the lower ends of the tubing coils to a liquid receiver on the condensing unit assembly. Figure 6-20. - Air-cooled condenser mounted on a compressor unit.